Everything you need for your event from A-Z including: Logo Design, Event Branding, Swag, Giveaways, Sign in boards, Screen Printing, Custom Invitations and Stationary, Lighting, Decor, Balloons, Foam Core Art, Flowers, Linen, Booths, Entertainment, Hostess Gifts, Photography and Videography, Music, Albums, Entertainment, Rentals, Tents, Lounge and of course Event Planning and Concierge services. Q: What kind of events is Events 360 for? From a small birthday party, brit, upsherin, bridal shower, baby shower, anniversary or engagement party to a large Bar/Bat mitzvah/Sweet Sixteen to Weddings and more. No job is too big or too small! Q: Are you required to use every service? Nope. You can use one or all and everything in between. Each business is independent so you can pick and choose which one you need. 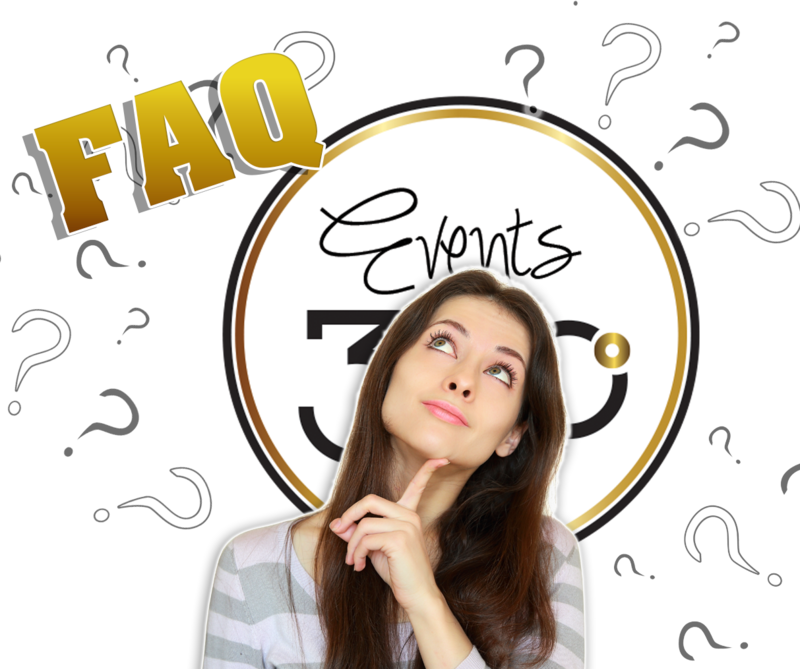 Q: Does Events 360 provide any packages? We have several packages depending on your budget for party planning, event conceptualization and branding. To get our latest package list as well as pricing please call us. Q: Can I walk in and start planning? You are always welcome to walk in and check out our space and samples however to start planning you will need to set up appointments. Our Event Concierge at the front desk will help you determine whom you need to meet first. You can also call us anytime at 516-295-6300 and we will get back to you. Q: Does Events 360 have any samples of giveaways and decor in the store? We have lots of great samples of linens, invites, swag, kippahs, benchers, apparel, booth items, hostess gifts and decor and if we don’t have it physically in our space we can provide pictures. Q: Is there a balloon service or theme decor artist? We work with the best balloon and foam core decor people in the industry and our prices cannot be beat. You will not pay more by going through us but you will get great personal service and our style and flare. Q: Do I need a party planner? If you are hands on and organized Events 360 makes it easy for you to plan and organize your own affair. That’s because you can work with each and every business to achieve your goals. Each vendor is an expert in their field and can help and guide you towards making the best decisions and because we are all connected, we can work together so the branding is unified. Q: Are there party planners at Events 360 I can hire? If you feel you want someone to help run your entire event from concept to completion, we can do that too. We have a host of incredible experienced planners whom you can hire to take on all the behind the scene action and be there day of to assure everything runs smoothly. We offer hourly and by the job for any budget big or small. Q: Do you provide an event space or caterer? No, but we certainly can help you find the perfect space or caterer. This service is offered in our party planner packages. We also can provide you with a list of spaces and caterers at no cost. Q: What are the benefits to using Events 360? Peace of mind. There is no need to run around trying to find the best sources for your event needs when you have the top creatives with stellar reputations and years of experience under one roof. In addition because all the vendors are connected, colleagues and friends it assures a more cohesive communication which is crucial for a smooth event. Plus if you live local it’s a huge advantage to have your vendors nearby.